This is Automatic Anchor Chain making machine suitable to make Anchor / Cable / Double Cable Chain from wire. The machine has variable speed controller and forced lubrication with electronic brake. The machine is supplied complete with all standard tooling and accessories complete with suitable electricals. 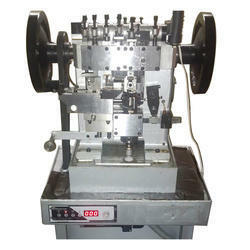 Automatic machine Suitable to produce side cut cable chain from wire die 0.25mm to 0.45mm by simply changing tools. Speed 400 links/min. Forced lubrication, Three Stop sensor, Variable speed motor with display. Power Consumption: Good power . We introduce our business as a noteworthy organization of qualitative array of Top Cut Anchor Chain Machine. We manufacture and export Anchor & Double Curve Machine which is made from advance technology and fine quality raw material. These machine are easy to use, these machines are durable portable and reliable. They are widely known for its low maintenance and long life hassle free service. These machines are available in various specifications based on the requirement of the client. Being a leading firm in this industry, we are deeply engaged in offering a high-quality range of Curb Anchor Machine. Being a noteworthy enterprise of this industry, we are offering a wide spectrum of Side Anchor Chain Machine.